North Carolina's Elizabeth Safrit was crowned Miss United States 2014 at the Sphinx Club in Washington, District of Columbia on July 6. Standing 1.75m tall, Elizabeth from Kannapolis is a senior at the University of South Carolina and is currently pursuing her degree in political science with a minor in journalism. She hopes to further a career in broadcast journalism after she obtains her graduate degree. She aspires to become a political news analyst for a major news network. 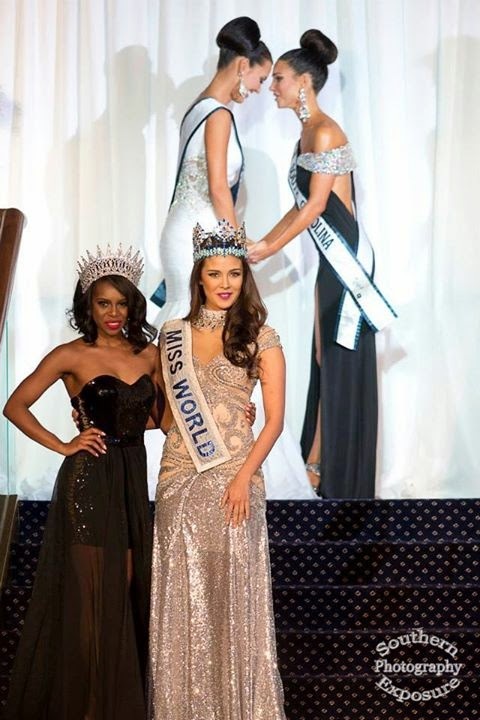 Safrit will now be the official representative of USA in Miss World 2014 in London, England on December 14. Mae-Ann Web (South Carolina) was the first runner-up and Vincenza Carrieri-Russo (Delaware) was the second runner-up. The third runner-up was Katy Moody (Kentucky) and the fourth runner-up was Khari Siegfried (Pennsylvania). Miss United States, a beauty contest headquarted in Washington DC, starts working with MWO this year. As a matter of fact, Miss World Megan Young was present at the event, which took place in DC. In the last decade or so, the American representative in Miss World had been selected by a modeling agency. It’s without a doubt an important stepstone for the pageant in the US. The new Miss United States has been envolved with charity activities for quite a while, which makes her the perfect candidate to represent her country in the world’s numer 1 beauty competition.